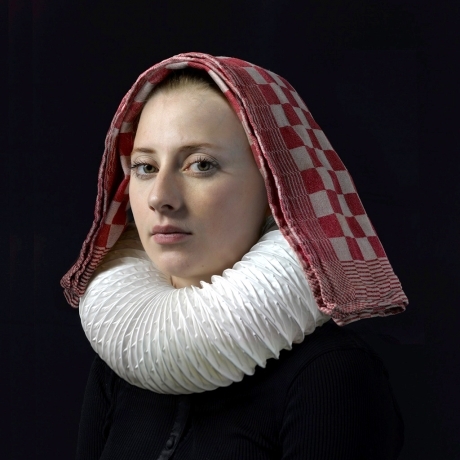 Born in the Hague in 1956, Hendrik Kerstens has for the last 17 years been producing an ongoing body of work that explores some of the many intersections between painting and photography. Using his daughter Paula as his only subject, Kerstens not only photographs her in reference to Old Master Dutch painting but also in relation to her own life and the world we live in today. Conceptually Kerstens' photographs address issues of seriality, time, and identity, while emotionally they speak to his love for his child and their ongoing collaboration.Pictorially, Kerstens photographs are masterful prints with an extraordinary combination of light and skin tone that signal a new technical level of achievement in printing. A largely self-taught photographer, over the last decade Kerstens has mastered his craft in a way that serves to dispel any lingering questions about the quality, validity, and expressive power of digital photography. Kerstens' work, however, is not just imitating painting. From early on, he became increasingly interested in combining the art of photographic portraiture with the game of creating a conceptual and sometimes humorous dialog between past and present. The titles give the game away. "Napkin" looks like a maid's bonnet. In "Bag", a plastic grocery bag is shaped to look like a lace hood. In other pictures no pretense is made to imitate 17th century clothing but Paula's face and Kerstens' light turn a modern hoodie into a classic and timeless garment. Kerstens' work has long been acknowledged for its many qualities but surprisingly this will be the first large scale solo exhibition of his work in America. (Previously Alexander McQueen, based his Fall 2009 collection on Kerstens' photograph of Paula with a plastic bag as a head-dress, using the image as his invitation for the show.) That same year Kersten's work was featured in the exhibition "Dutch Seen" at The Museum of the City of New York. Currently his image "Hairnet" is the cover image for Pier 24s current show "About Face" – an exhibition focusing on the tradition of portrait-based photography – alongside artists such as August Sander, Diane Arbus, and Richard Avedon.